Located in the very centre of Leskovac, it started working on July 2 2007. Upon completion it contributed to the shaping of the modern image of Leskovac. The hotel has 8 rooms and 5 apartment suites. All rooms are luxuriously fitted, with satellite TV, air conditioning, mini bar, internet connection, telephone, etc., making the hotel pleasant even to the most demanding users. Within the hotel is the restaurant, serving diverse specialties from both national and international cuisines. Capacity: 130 beds in one-bed, two-bed and three-bed rooms. The rooms are with bathhrooms, air conditioned, and fitted with TV and mini bar. The restaurant is of the capacity of 450 guests. 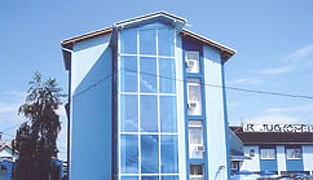 The capacity of this hotel is 50 beds in 6 apartment suites, 3 three-bed, 4 single-bed, and the rest in two-bed rooms. The restaurant is of the capacity of 600 guests, and the terrace, 300 guests.